» Yes, the 2015 MLB Trade Deadline Was As Insane As It Seemed. Here’s Proof. Yes, the 2015 MLB Trade Deadline Was As Insane As It Seemed. Here’s Proof. MLB general managers earned their unlimited mobile plans last month. If we count a small, lopsided-sounding deal between the Diamondbacks and Phillies — two minor leaguers and future considerations to Arizona for (wait for it) future considerations1 — every major league team made a trade in July. Because GMs tend to procrastinate keep their options open as long as possible, most of those trades were clustered toward the July 31 non-waiver trading deadline, the last day on which teams can move players without exposing them to claims from other organizations. And most of those trades involved some serious present considerations. The days leading up to the deadline resolved the status of multiple high-profile trade candidates who’d been on the block for ages (Troy Tulowitzki, Cole Hamels) and brought us several prototypical rental trades for free-agents-to-be. Although some likely trade candidates — White Sox starter Jeff Samardzija, half the Padres’ roster — stayed put, their absence from the newswire was easy to miss amid the stream of other starters (Scott Kazmir! Johnny Cueto! David Price!) and sluggers (Ben Zobrist! Carlos Gomez! Yoenis Cespedes!) changing teams. In the moment, it seemed like an abnormal amount of activity. In retrospect, it still does. But we need numbers to know for sure. Was the 2015 trade deadline as active as it seemed? And if so, what might that mean? There are a few ways we could assess the value of the players traded each July, each of which comes with caveats. We could look at how much the players were worth in the year they were dealt, but in that case, we couldn’t make a fair comparison to this year’s crop of traded players, who haven’t yet played a full season. We could look at what each year’s players were projected to do post-trade, but that would require us to run retroactive rest-of-season projections for players from seasons that predated public projection systems. We could also add up what the traded players did prior to the deadline for the teams that dealt them, but we’d inevitably shortchange or over-credit some players who were moved after an anomalous few months. One way around most of these issues is to evaluate each group of July trade-ees by the value they produced in the previous season. In other words, Tulo, Price, Cueto, & Co. would be judged by their performance from 2014, while the players traded at last year’s deadline would be evaluated based on their 2013 stats, and so on. In many cases, this method more accurately captures our sense of how significant a transaction seems. Tulowitzki, for instance, is having an off year, so his season-to-date stats don’t stand out. But his move to Toronto was still big news, because his past performance raised our expectations that he’d play like a star down the stretch. The non-waiver trading deadline shifted from June 15 to July 31 in 1986, so we’ll examine the period from ’86 on, giving us a 30-summer sample. To identify and evaluate each July’s traded players, we’ll pair transaction records from Retrosheet (1986–2008) and Major League Baseball Advanced Media (2009–15) with Baseball Prospectus’s player-value metric, Wins Above Replacement Player. Conceptually, WARP2 is similar to WAR, although its values tend to be slightly lower: 101 players recorded at least 3.0 WARP last season, while 133 and 137 players totaled at least 3.0 WAR at FanGraphs and Baseball Reference, respectively. 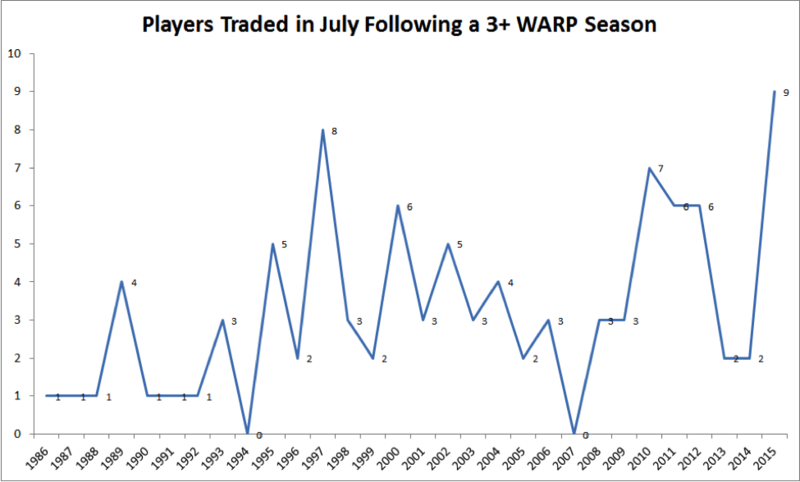 The graph below shows the previous-year WARP produced by all players traded during each July, broken down by batter WARP, pitcher WARP, and a combination of the two. Before the mid-’90s, the trade deadline was hardly a cause for excitement. Soon after the 1994 strike, though, a confluence of factors — the wild card, MLB’s expansion to 30 teams, the game’s escalating salaries — transformed it into an occasion worth rosterbaiting about. But despite a series of active deadlines over the past two decades, no trade season has ever come close to rivaling the activity we saw this season, even with A.J. Preller not pulling his weight. 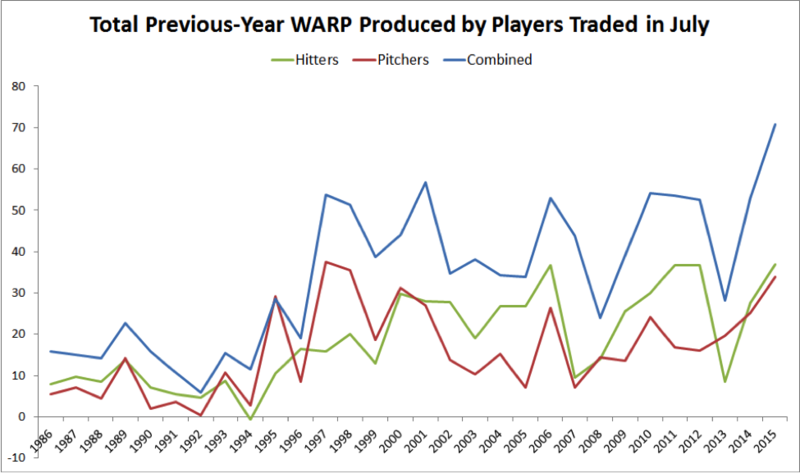 Players traded last month totaled 70.8 WARP in 2014, dwarfing the previous-year totals of the players traded in former peak years 2001 and 2010, both of which had WARP figures in the mid-50s. This year’s batter and pitcher WARP totals were both close to all-time highs. Put the two together, and the result is a record deadline. As one would expect, the 2015 deadline’s huge haul is partly a product of increased quantity. The table below tells us the number of players traded in each of the past seven Julys, minor leaguers included. Nine players — eight I listed in the second paragraph, along with Juan Uribe, who finished with 3.7 WARP last season despite two hamstring strains — were traded last month following seasons of 3.0 or more WARP. That’s the most such players moved in any July, edging out 1997, when eight (Mark McGwire, Harold Baines, Ken Hill, John Smiley, Felipe Lira, Danny Darwin, Wilson Alvarez, and Scott Sanders) qualified, and 2010, which had seven (Yunel Escobar, Lance Berkman, Miguel Tejada, Dan Haren,4 Cliff Lee, Edwin Jackson, Ted Lilly). This year also featured a solid second tier — Jonathan Papelbon, Gerardo Parra, Mike Leake, and more — making it a far cry from a recent deadline low point like 2007, when some interesting trades were rumored but not many were made. Last month’s trade market doesn’t have to have any deeper significance. We could just savor it for what it was: the best-ever time to compulsively refresh MLB Trade Rumors (when the influx of traffic wasn’t overloading the site’s servers). But we can also connect the dots between an extra-active deadline and a few other 2015 trends. Improved Parity: I pointed out in March that preseason projections forecasted a closer season than we’d seen in some time, particularly in the American League. And while some of those projections have been off — in a few cases, spectacularly so — we know they might continue to have predictive power, even at this point in the season. Only the AL Central race looks close to decided, and with 10 playoff berths up for grabs, most teams are still close enough to convince themselves they’re contenders, sometimes to their detriment. Formerly Bad Teams Buying: Over the offseason, Sam Miller observed that losing teams from 2014 were doing most of the offseason spending, as they prepared to pull out of their dives. Long-time have-nots also put their stamps on July, which was dominated by the Astros, the Royals, and the club with the longest postseason drought in baseball, the Blue Jays. We’re wired to find new experiences stimulating, and the sight of those three teams close to the top of the standings — along with the Mets and the Twins — is enough novelty to distinguish this season from the last several. Aggressive Prospect Promotions: From 1990 to 2014, an average of 28.7 prospects have appeared on a preseason top 100 list at Baseball America or Baseball Prospectus and gone on to make their big league debuts the same year. This season’s total will top that this week, when Henry Owens starts for the Red Sox, Luis Severino starts for the Yankees, and Jon Gray starts for the Rockies, bringing the number of players on BP’s February Top 101 list who’ve made the majors for the first time in 2015 to 29. Historically, almost 30 percent of preseason-ranked prospects have made their debuts in September or October, when rosters expand. This season, a few days into August, we’re way ahead of schedule. And as I’ve noted before, those numbers aren’t being padded by prospects on the low end of the list. This season’s prospect arrivals have also been of unusually high quality, featuring BP’s entire preseason top five, six of its top 10, and 12 of its top 20. On the heels of last year, which brought us notable parity and a nail-biting October, we’re watching a season in which few teams entered the spring out of contention; clubs we’d come to know as perennial losers are among baseball’s best; a few of the sport’s oldest, most popular franchises — the Yankees, the Dodgers, the Cardinals — are also in first; playoff contenders are doing everything in their power to get better, both by promoting their own talent and by importing other teams’; and young players are excelling, led by Mike Trout and Bryce Harper, two 23-and-under superstars who’ve become the best players in their respective leagues. On top of that, there’s labor peace (or at least a lack of labor blowups), record revenues, and fancy new stats that are illuminating formerly mysterious facets of the sport. Judge baseball purely on its on-field product, as opposed to its perceived popularity relative to other sports, and it’s hard to dispute the league’s party line: In many respects, today’s version of the sport stacks up to that of any earlier golden age. How’s that for a future consideration? Thanks to Rob McQuown of Baseball Prospectus for research assistance. Fortunately, the considerations the Phillies sent were smaller. Which is pegged to BP’s preferred rate stat for pitchers, Deserved Runs Average. Counting two-time trade-ees like Cliff Floyd, who was traded twice in July 2002, only once. Who was traded again last week.